Anyone who frequents the Halifax Waterfront or the Seaport Farmers Market will recognize this bright little face. Carter MacNeil loves performing with his tiny violin and at age three has already achieved an element of local celebrity. Carter’s dad is Don MacNeil, Director of the Faculty of Engineering at Saint Mary’s University, and his mom, Tina, works from home as an artist. The whole family is involved in nurturing Carter’s love of music. Busking has him regularly out and about with his parents in all kinds of venues and festivals – wherever he can find a gathering of music lovers. Carter jumps at the chance to play with featured performers and has on occasion been invited to share the stage with the likes of McGinty, Dave MacIsaac, and even Symphony Nova Scotia. 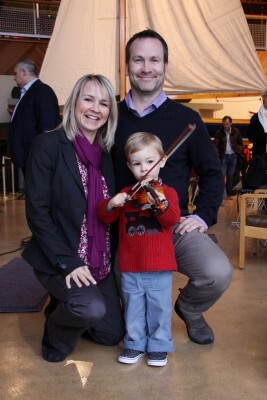 Carter ‘s best experience (so far) with Symphony Nova Scotia was at the Family Series concert last year at the Maritime Museum of the Atlantic. The Family Series concerts are a hit with the whole family. Don talked about why music is so important for the MacNeil family. “It’s a gift for Carter to be able to create this imaginary space,” adds Tina. “He becomes the creator of his own little musical world… and when he performs he’s able to share it with other people. 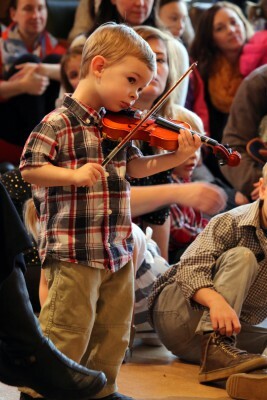 Carter has also participated in the Symphony’s Musical Munchkins program at the Captain William Spry Library. “It’s usually packed with about 30 kids and two musicians with different instruments, says Tina. “Last time was an English horn and a Clarinet. It’s really interactive – a lot of singing and games. Carter loved it. We’re also going to Pop goes the Easel in April. I have an arts background and I’m really looking forward to that. Watch this short clip of Carter playing with the Symphony (thanks to classicconcertsns.ca)!